Don't worry. 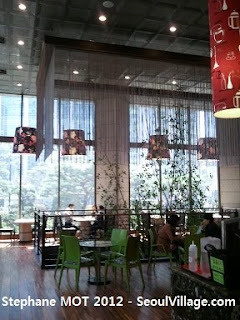 I won't restart my usual rant about the pervasiveness of coffee shops in Seoul (see "Brews and bruises"). This book cafe has something really special. To get in, you have to leave an I.D. at a police booth, and that's totally normal since you're entering the headquarters of Seoul Metropolitan Police Agency (SMPA). From Gyeongbokgung Station exit 7, you can't miss this hulk of a building topped by an antenna that competes with Namsan Tower at night (picture two giant cuttlefishes exchanging colorful, LED-powered distress messages). 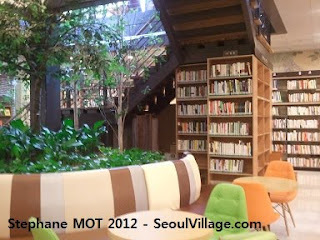 The main entrance is on Naejadong-gil (now Sajikro-8-gil), but for the cafe, use the small one on Saemunanro-3-gil, opposite KEB / Kim & Chang. Likewise, there are two entrances for this book cafe, the 'cafe' part being on the ground floor, and the 'book' one down a large set of stairs. The atmosphere is rather cool, and the proportion of uniforms lower on week-ends. Now regarding the book section, this is serious stuff, far beyond the usual pseudo-cultural alibi (worn out hip magazines on stylish shelves): you're in an actual library, with rows of neatly sorted volumes. And if 99% of them are in Korean, they cover a wide scope: Korean literature, English literature, French literature (featuring Portuguese authors but we share the same Latin roots anyway)... Bonus, a whole section you won't find in any other library: "경찰" - "Police", complete with corporate news and criminal cases. Here, anyone can borrow books, up to three per fortnight. I like your last sentence. I was shocked by the terrible accident( I don't have courage to write detailed words due to shock). 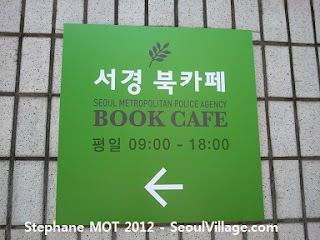 Anyway the book cafe in the police headquarter is a good idea since they need at least common sense to a minimum as we just recognized in the accident. The accident was truly shocking, and every day brings new revelations about the failures of that doomed non-investigation. Even the sad story that inspired 'Memories of murder' pales in comparison.